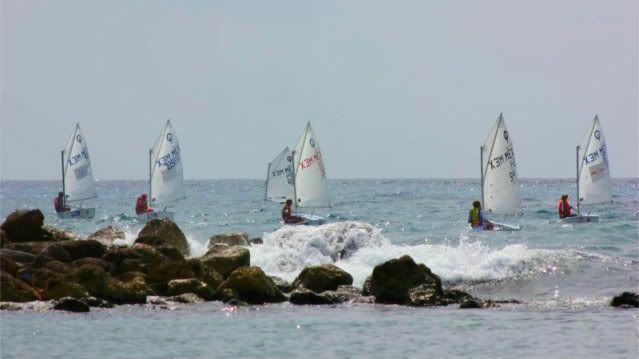 January 31 to February 3, the 2013 "Copa Riviera Maya" Regatta will take place, hosted by the Sailing Club of Puerto Aventuras. Michelangelo Pani, President of the Mexican Windsurfing Association, reports that there will be 170 boats and 200 sailors from all over Mexico participating in this event. Child, Youth and Olympic sailors will compete in the categories of Optimist, Olympic Laser, Veleros 420 and Olympic Level Windsurfing. This will be the first event of the Circuito Nacional de Vela 2013. In these four categories, there will be qualifying heats for upcoming State, Regional and National competitions for 2013. Young sailors from 8 to 11 years of age, or those weighing under 45 kilos, will be competing in the Optimist class, which is the formative level. The Optimist is the vessel traditionally used to teach the basics of sailing. Upon graduating from this class, either by age or by weight, youth sailors pass to the Olympic class of their choice, either in Windsurfing or the Laser class. Sailors can then continue their training, working to become elite athletes or as recreational sailors. Likewise, the 420 class, in boats for two helmsmen, is formative training for Olympic class vessels with a sailing crew of 2 or more. To close the event, Natalie and the Foxes will be performing LIVE at the Puerto Aventuras Cultural Center starting at 7pm. Food and beverages will be available. Admission is 80 pesos. Tickets are available at the Colonos office or at the door. This event has the official endorsement of the Mexican Sailing Federation, the Mexican Association of Optimist Sailors; Mexico Laser Association, National Association 420, Mexican Association of Wind Surfing and Cojudeq. Regatta sponsors include the PA Fideicomiso, Nissan Cars, the Colonos, the Playa del Carmen municipal council, City Club, Coca Cola and the PROA Sailing Association.